“We aren’t planning to go public anytime soon. As a company, I think we look at going public differently than many other companies do. For a lot of companies, going public is the end goal and they shoot for and optimize around it. 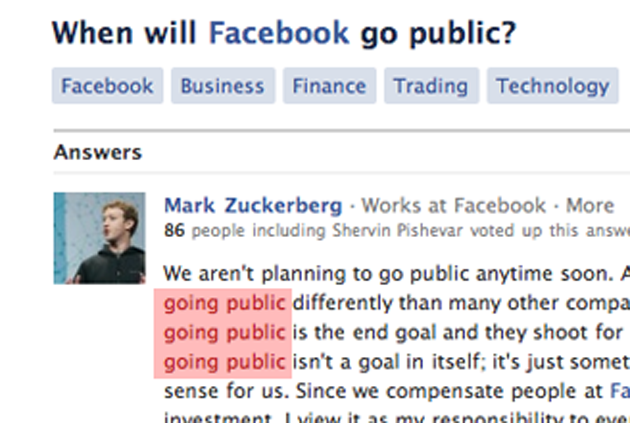 For us, going public isn’t a goal in itself; it’s just something we’ll do when it makes sense for us. Since we compensate people at Facebook with stock and we took investment, I view it as my responsibility to eventually make that stock liquid for people, but that doesn’t have to happen in the short term and our primary responsibility is still just to make sure Facebook develops to its full potential. Apple isn’t the only valley behemoth who doth protest too much, Google co-founder Sergey Brin also echoed Zuckerberg’s “hell no we won’t IPO” sentiments soon before Google, yes, went public. If what Zuckerberg’s saying is that an IPO would put too much pressure on Facebook with regards to product releases, the case of Google is also apropo, as the search company’s stock seems to have weathered the releases of controversial products like Buzz and Streetview. 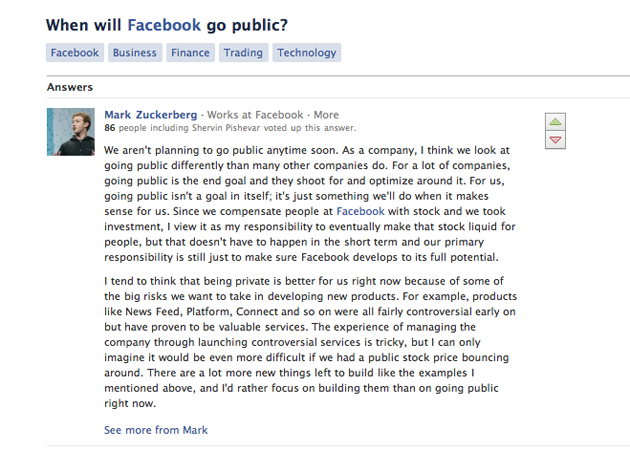 Update: Commenter Dav Yaginuma points out the pretty hilarious unintentional lineup of “going public, going public, going public” in Zuckerberg’s paragraph layout.